A really fun class! Katie is such a good teacher and her one-on-one feedback was so helpful. Learnt SO MUCH, Katie was LOVELY and we got to keep all the materials! I was practising at home straight after the workshop!! Loved the class! Went home and continued practicing! Katie was a great teacher, it was a small class so there was plenty of 1:1 time. Will be practicing and then be back for the improvers class! Katie’s class was great, it was my first calligraphy class and Katie spent time really covering the basics and giving help and advise. We got our personalised kit to take home and there were drinks and cake as well! ☺️ I will definitely be doing Katie’s improvers course. It was really good fun, the whole thing lasted two hours but it flew by, it's extremely therapeutic, I've never done it before but Katie was really good at teaching us and also taking the time to give us one-on-one tuition. We also got some great stuff to take home so now I have stuff to practise with. I will sign up for the improver's class too. I thoroughly enjoyed my first ever calligraphy workshop. From the moment you walk in to Wilton's Music Hall, Katie makes you feel very welcomed. We learnt the very basic skills of holding the pen, and by the end of the class, we were all well on our way to writing words. The class is just small enough to have time speaking with Katie to help you personally improve. I'd really recommend it to anyone thinking of starting a new hobby! Katie was an amazing instructor and I learnt so much from the workshop. Thanks, Katie! 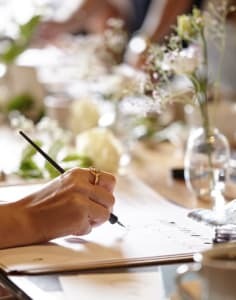 This was my first calligraphy workshop and Katie was brilliant. Was made to feel very welcome, learnt lots, really enjoyed the evening and loved the calligraphy goodies we were given to take home. Thank you Katie. Well worth it! Time flew by and the location very cute. The materials were great and instructions clear. Katie was really helpful and patient :) I've never been so focused. Definitely will continue practicing. A great session in a lovely location. Very informative class, and had the opportunity to get 1 on 1 feedback to improve you're own style. Highly recommend the class! Brilliant class, the teacher Katie was great, learnt a lot. I really enjoyed this class. I was worried at the start that I wouldn't be able to get the hang of it at all, but the instructor Katie was very helpful and encouraging and I improved massively in the space of two hours. It was a very fun way to spend an evening and I came away with a real sense of achievement. Absolutely loved this class! Katie is amazing and very helpful/patient. If youve got no experience or some experience this class is perfect for you! I really enjoyed this class, it was in a beautiful building, with music playing and a selection of biscuits and tea! I felt I got my money's worth three times! The teacher was very friendly, polite and seemed to want us all to continue studying after we left her course. Very relaxing experience. We loved the workshop with Katie! She is super competent, very patient and kind. We are very happy with the progress we have made in just two hours. Highly recommended. Alessandro & Victoria. Absolutely loved it!Highly recommended A. Brilliant class. Gorgeous setting, brilliant teacher and lovely little touches like drinks and cakes being included made it really special. Would highly recommend. Really enjoyable class at the Art Workers Guild last Saturday. Katie is a brilliant and patient tutor. She created such a lovely ambience for us all in a beautiful room. Very thoughtfully set up which included refreshments, croissants and roses - how cool(?!) - as well as ink, pen and paper. 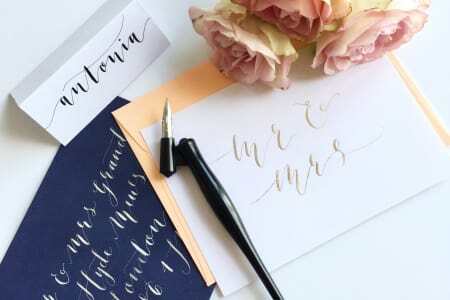 I would highly recommend this class to anyone who has an interest in learning Calligraphy. 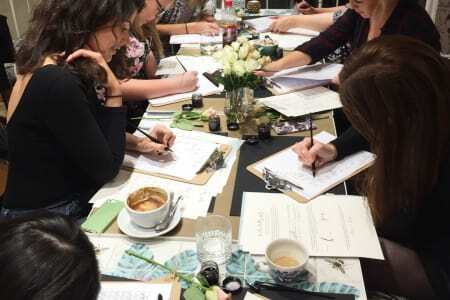 Katie is a wonderful host and teacher, and she will take you through the different steps in getting to know your materials, understanding the basic movements and strokes to achieve a crisp and elegant look in your letters and words. I left feeling confident that I would be able to continue practicing and improving on my own until I am able to join an improvers class. Loved Katie's class! It was really relaxed and a small group which meant Katie could give 1-1 feedback and guidance. Katie has also been very responsive since the course, providing more advice. Would totally recommend it! Katie was such a brilliant and patient teacher. Even in a class full of 11, with everyone at different abilities - she was able to give 1 on 1 time specific to our needs. The music and ambience was also a great plus. Very therapeutic. Highly recommended. The two hours flew by. Katie was really welcoming and approachable so the atmosphere was completely relaxed. Having not done any calligraphy before it was a great intro and I feel confident to practice at home now. Absolutely loved it! Highly recommended A.